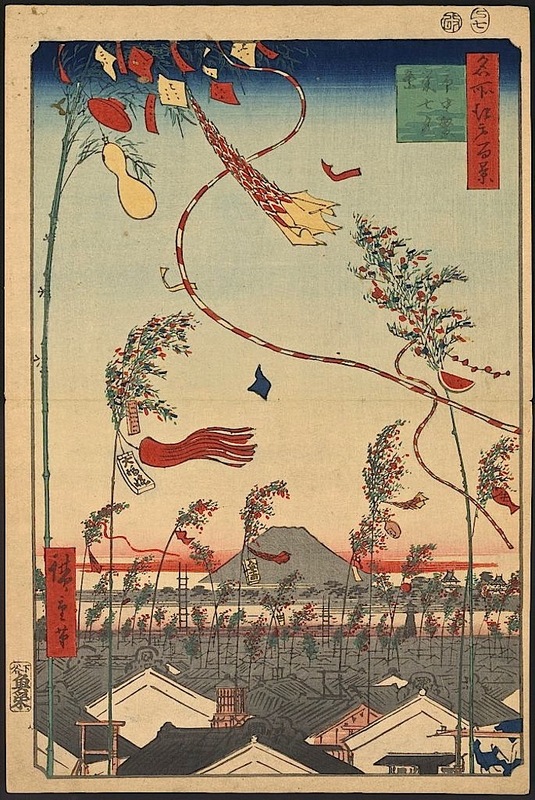 Shichūhan’ei tanabata matsuri (The city flourishing, Tanabata Festival), 1857, by Andō Hiroshige, via Library of Congress Prints and Photographs Division. The print shows tall bamboo decorated with cutout ornaments and paper streamers bearing wishes above Tokyo’s rooftops during the festival, which begins on July 7. Tanabata, or “evening of the seventh,” honors the yearly meeting of two deities/stars/lovers, Orihime (Vega) and Hikoboshi (Altair). I find it so moving, the things that say “celebration” to the different peoples of the earth. Also, you can’t beat the Japanese for expressing joy through paper. I may have to start honoring this holy day. This is charming. Looks like a very windy festival day!